In it I would serve mojitos, pepper-mint limeade and a third beverage that I would decide on through an online poll. Here is a link to the original post at Outblush.com and a link to the product at ZGallerie.com. 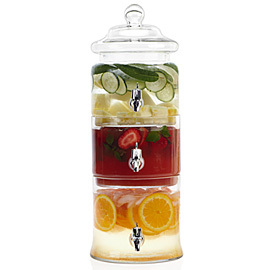 $70 is a little much for a beverage dispenser. But that one is seriously legit! Hey it's gotta go on sale eventually...right?